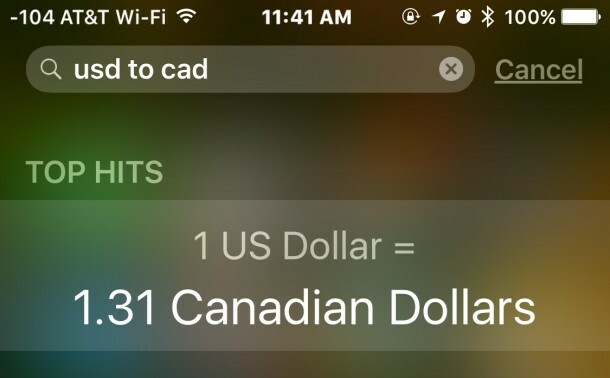 Spotlight Search for iOS now has the ability to perform currency calculations and conversions using up to date exchange rates. This is a handy built-in feature for travelers, anyone who needs to exchange money, and those who work across borders, and it’s built right into the latest versions of Spotlight for iOS on iPhone, iPad, or iPod touch. 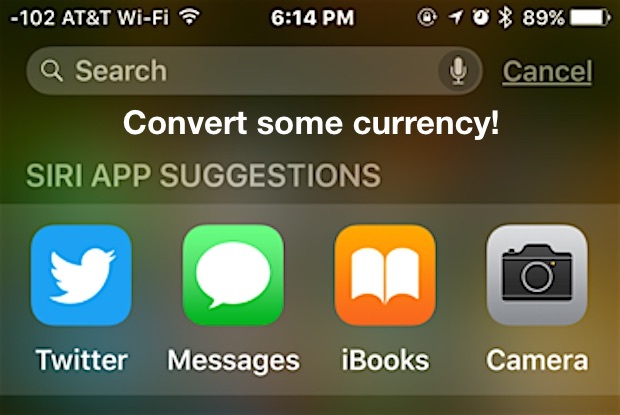 This is just an example, as any major world currency is supported for conversions in iOS. As long as the iPhone, iPad, or iPod touch is connected to the internet it will pull the most up to date exchange rates for the currency conversion. OMG, thank you for this tip! Sorry meant to say I use the Stocks app. I don’t see a way to edit posts here. This syntax doesn’t work on my phone. Is there any settings needed for special currency like Vietnamese Dong? It seems that some of the less traded currencies from Yahoo Finance are not available. I was not able to pull up the Vietnamese Dong (VND), ETB, IEP or PHP, but I was able to pull up some I did not expect like ILS and KRW. You might want to update the “Spotlight on the Mac” note you linked here. 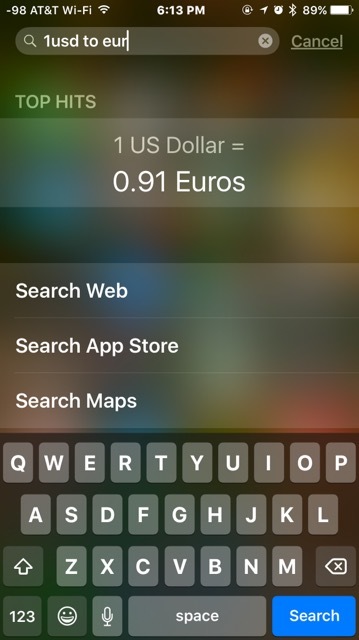 With Spotlight on the Mac it is now possible–at least with 10.11.5–to use the three letter currency symbols the same as you did here on iOS. This means you are no longer required to input currency symbols on the Mac! Siri has been doing this for a very long time. 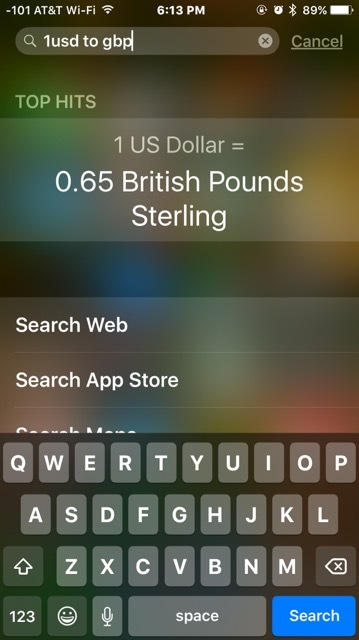 Just say, for example, “Siri convert ten dollars US to British Pound Sterling” or “Siri convert ten Euros to US dollars”. Okay, this is awesome. I didn’t knew about it. I was using Stocks app previously to keep an eye on some currency values but this is quick. Also – in Europe – if you just enter 300 USD for instance, it’ll directly convert to € without having to add “to EUR”. Nice feature. Is there a way to change the default settings? If I write 35m it automatically converts to yards but I would like it to convert to feet. I have tried “35meter to feet” but that does not work.